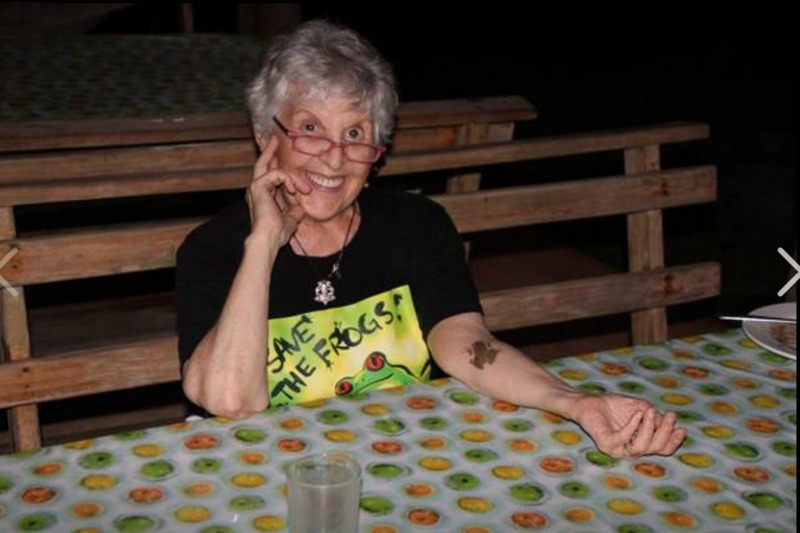 Funds are used to support A Frog House, to encourage others to love, save, and shelter frogs. Read https://www.toptenz.net/10-things-happen-without-frogs.php . for sale at A Frog House, at my website (and on Amazon and through Barnes and Noble for a few extra dollars). 2) The design and publication of my next children's picture book, Froggy Family's Fine Feelings, already in the making. 3) Preparing the gardens and Frog House for everyone to enjoy. I have donated many copies of Froggy Family's First Frolic to school classrooms, scout troops, and doctors' and dentists' offices. 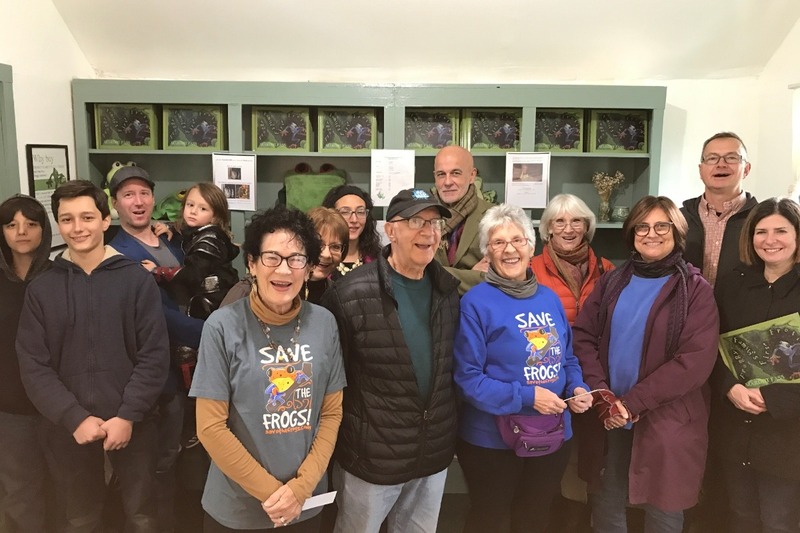 When visiting children's groups, I teach about the wonders of frogs, why they are endangered, the wider meaning of frogs to the environment, and what we can do about our mutual plight. To further raise money and awareness, I also am selling other frog artwork as well as miscellaneous Frogabiia at A Frog House. My husband is almost 84 and I am 78, so any help we can get will go to this guaranteed good cause, and be GREATLY appreciated. Thank you for helping us, children, and especially, the FROGS! 4. 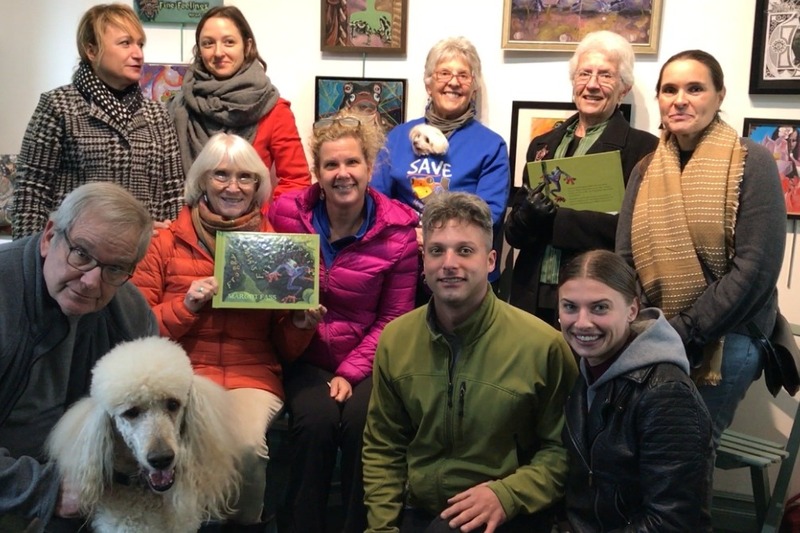 Pittsford Adventures and Frogs 2018.11.27 Their Many Gifts and Meanings. Is the wrapping or what's inside most important? In the case of the glass frog, If you were looking at it from the bottom, you would actually be able to see the heart, liver and intestines. I can never get over the gift of seeing the inner perfection of this little miracle. The transparency of glass frogs provides a gift to themselves as camouflage, but it's a bother for predators who can't see them. . Some people feel protected and more like themselves when covered rather than exposed. The gift of disguise helped my Frog Friend become very outgoing and friendly. His antics in turn were a great gift to a delighted five year old girl, thrilled with a talking frog. My friend had the gift of inspiration to dress up. This warmed my heart, so I naturally feature him and his pal, Winky, on accidentally discovered, unpainted ornaments. They look like A Frog House, sort of. While not great works of art (or quite done), working on them gives me the gift of relaxing and having fun during my work week. Brightly colored frogs usually are poisonous, so their skin is a warning gift to predators to stay away from them. This is a gift to look alike frogs as well, who are left alone even if they aren't actually inedible. The two blue dart frog likenesses in the form of 6 x 6" paintings might in themselves be great gifts. The background of each is from a photo I took at a wagon wheel factory in Costa Rica. Visiting this colorful artisan shop was an alternate gift to SAVE THE FROGS! travelers. The original plan was to go to Tortuguero, but the roads were closed due to a storm on the coast. Flexibility, resilience, survival against all odds, are among the valuable lesson gifts frogs have to give. Above all, if we retain the gifts of thanks, awe and wonder, and not give in to the demoralizing forces of greed and rage in our world, we are likely to have a happy life in spite of those factors. 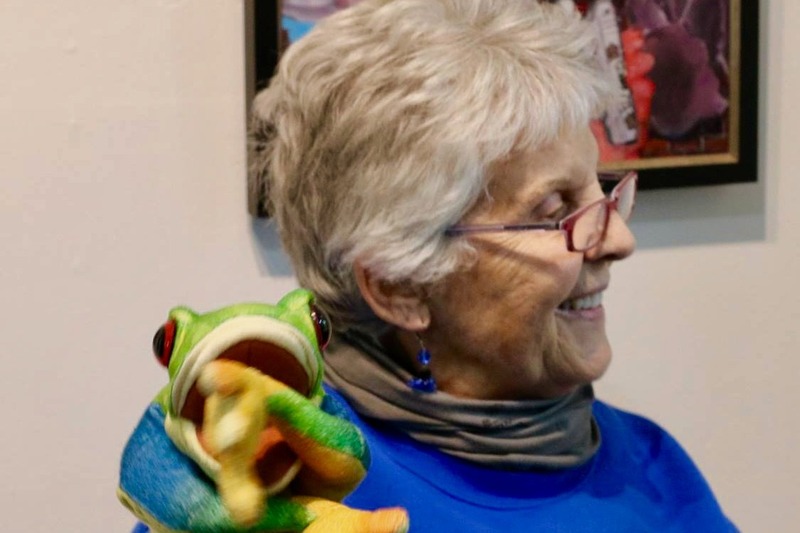 If you would like to share your own joy and love of life, bring your young at heart to find gifts in our collection, including my newly reprinted children's book, Froggy Family's First Frolic, frog art work, cards, and frogabilia. 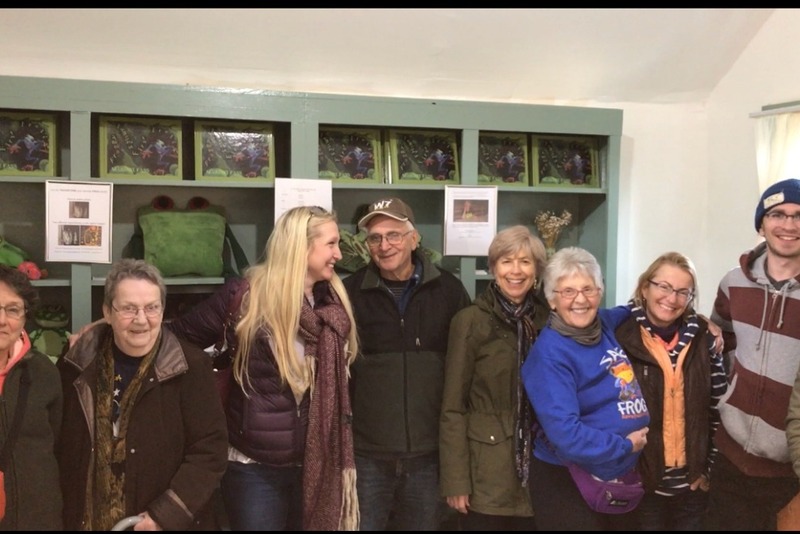 All are in A Frog House, 65 State Street, Pittsford Village, NY, located on the Erie Canal (third house on the left, heading east on the towpath from Schoen Place) We are there on Sunday afternoons from Noon to 5 pm. Saturdays until Christmas, and first Friday in December, you will find me, the book, cards, and art work at Main Street Artists, Suite 458, in the Hungerford Building, 1115 East Main Street, Rochester. Many of my fellow artists will also value your visit. AND, I just learned that today is GIVING TUESDAY. Anyone donating more than $50 to the Froggy Family Fabulous Foundation is entitled to a copy of my next children's book, Froggy Family's Fine Feelings, COMING SOON. Margot Fass Here's me with Paddy in the A Frog House reading the newly reprinted Froggy Family's First Frolic. I've got a cracker jack designer for my next book, Froggy Family's Fine Feelings. We are attempting to raise money for this project to further educate and enlighten the world about the importance of frogs. Please donate* to the Froggy Family's Fabulous Foundation. If you give more than $50, you will be listed, as my current donors are, as an honorary recipient of the new book. * https://www.gofundme.com/froggy-family039s.../donate . It is Giving Tuesday after all!